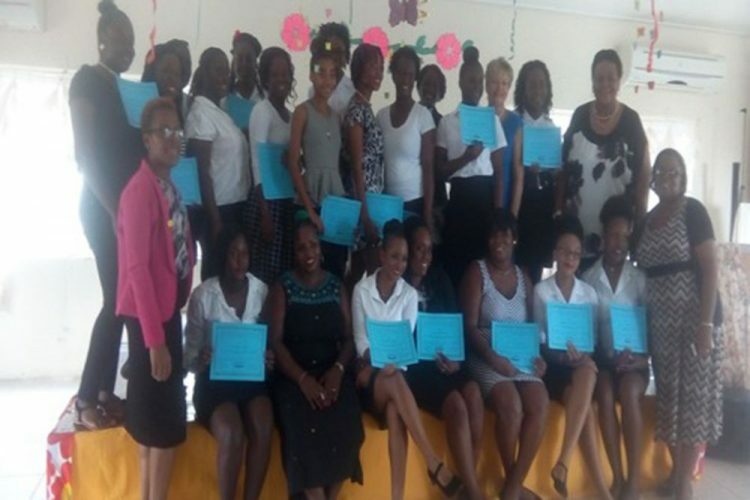 Twenty-one young women who are assigned to pre-schools and day-care institutions in St Vincent and the Grenadines graduated from a one-month programme of training in Childcare and Development at the Vinsave Child Development Training Centre, Tuesday, June 27. The course, which was offered in conjunction with the Youth Affairs Department in the Ministry of National Mobilization and funded by the Mustique Charitable Trust, comprised theory and practice, and was specially designed by Vinsave to meet the needs of the students and prepare them for further training in Early Childhood Education. It was also designed to help the trainees to be better able to meet the social, emotional, intellectual and nutritional needs of the young children in the Child Development Centres. Speaking at the graduation ceremony, youth officer Philcol Jeffers stated that the âYouth Employment Service is about development of a young personâs lifeâ. He also encouraged them to be tactful, resourceful, inspirational, innovative and disciplined in their daily work. Jeffers congratulated them for the successful completion of the programme. He announced that they will be placed for another year on the YES Programme, during which time their work will be monitored by Vinsave. He encouraged them also to use the opportunity for further advancement. Other remarks came from Lavinia Gunn, administration director of the Mustique Charitable Trust, who pledged the Trustâs support to the training and development of young people. The course report was presented by Jacqueline Robinson-Massiah, training co-ordinator, and opening remarks by director of Vinsave Janice Fraser. The students were presented with Certificates of Participation, and tokens from Vinsave.